With all the guests I hosted and cooking I did in October, the month just flew by, and somehow the Cover Recipe Challenge got pushed to the back burner. However, in true Food Girl in Town fashion, I finished the challenge and posted late, so here it is! If you are not a fast chopper this recipe will definitely take you longer because of all the ingredients involved, but we managed to take care of the dicing at a quick pace. Then all that we had to do was pour the ingredients into a pot and let it cook for a few minutes. 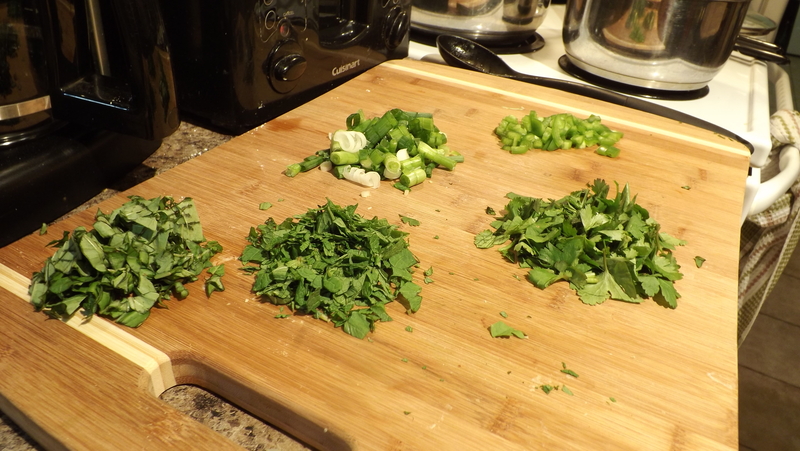 Even though Erin was a little premature adding the cilantro, the flavour of the soup turned out amazing! Served over rice, the soup’s broth of coconut milk, green curry paste, and fish sauce was the perfect compliment to the scallops and the shrimp; a super easy to follow recipe that turned out just like the picture! For the main course I made the cover recipe for October: Honey-Soy-Roasted Pork with Braised Vegetables. The instructions for this recipe were pretty easy, as were the ingredients. One of the only alterations that I had to make was for the pork itself: the recipe called for boneless pork shoulder roast, and I went with bone in, pretty much for aesthetic value, and because I didn’t want the roast to dry out too fast. After searing the pork, it went in the oven with the sauce and the vegetables. So this recipe called for a cup of veal demiglace, and after numerous grocery store trips and countless tweets, I finally was able to track down some veal demiglace courtesy of fellow blogger and photographer extraordinaire Kelly Neil. Unfortunately, on the night of the challenge I wasn’t able to pick up the demiglace so we had to make due without it. I made a quick red wine and balsamic reduction to replace the demiglace and it ended up tasting pretty good! 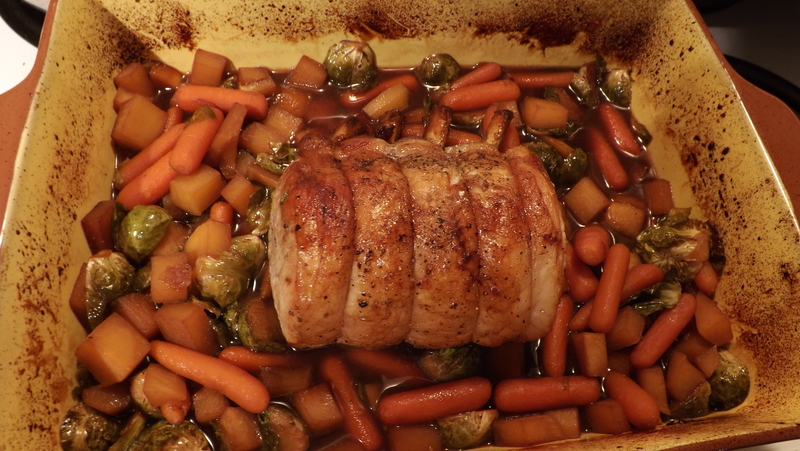 The pork came out at the perfect temperature in the time indicated by the recipe and I served it with the carrots, brussels sprouts, and turnip that it was cooked with. I also served up a healthy portion of mashed potatoes to complete the main course. 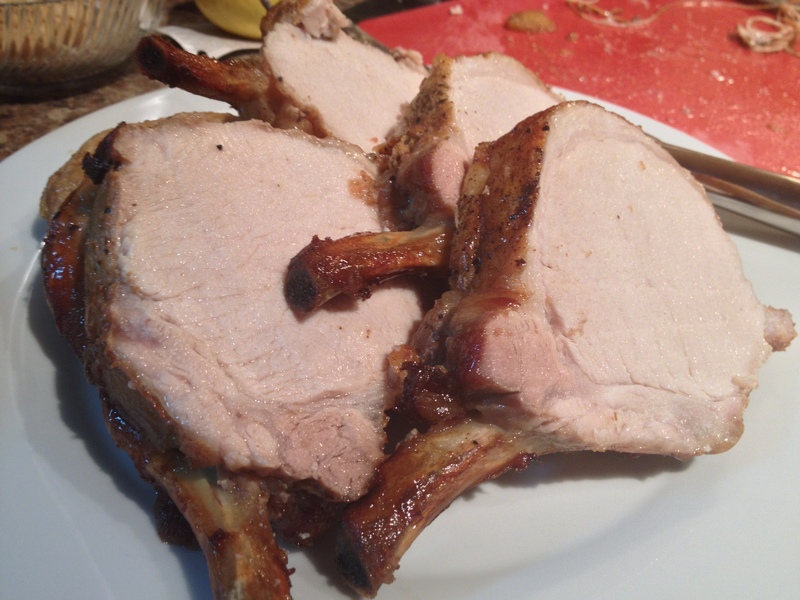 The pork was SO juicy and it really didn’t take very long to cook at all, it was delicious! 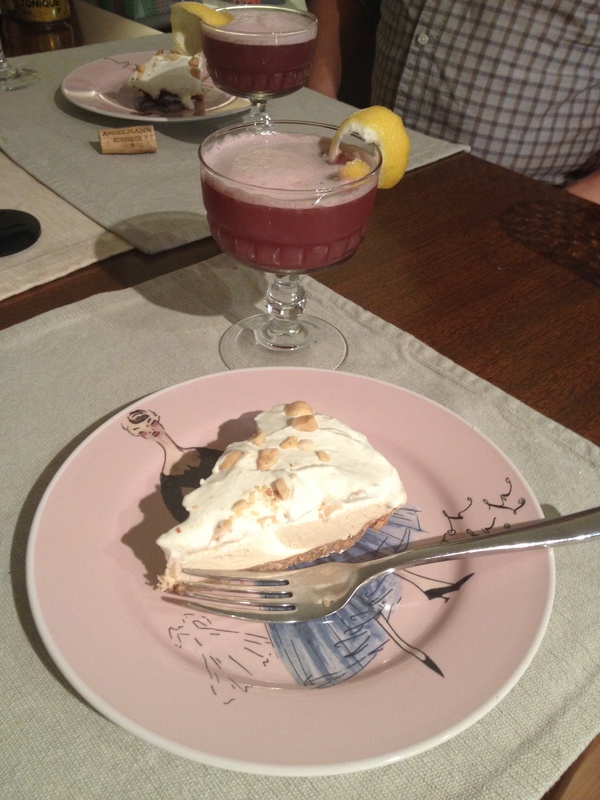 Though the pork was delicious and we all enjoyed it thoroughly, the piece de resistance was dessert: Creamy Peanut Butter Pie with Concord Grape Gin Fizz. Basically this dessert is grown up peanut butter and jelly and it rocks! The Creamy Peanut Butter Pie was surprisingly easy to make, despite the fact that it took a while to complete all the steps. 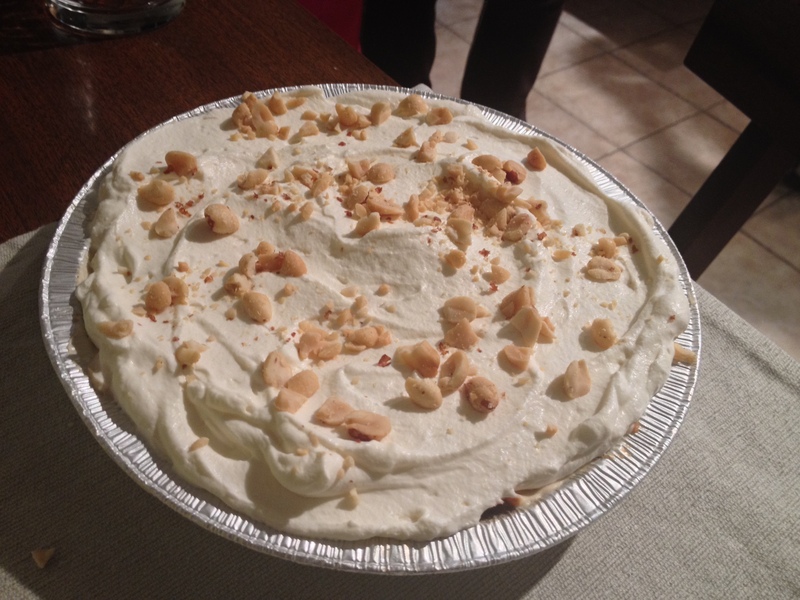 The pie consisted of a peanut butter cookie crust with a rich and creamy filling of peanut butter and cream cheese, and topped with vanilla whipped cream and chopped peanuts….what’s not to like about this pie? It was divine. I couldn’t blame the boys for hovering over me to lick all the spoons I used while baking it, it was DELICIOUS! The magazine paired the pie with a delicious grape alcholic beverage, the perfect match to this grown up twist on a classic. 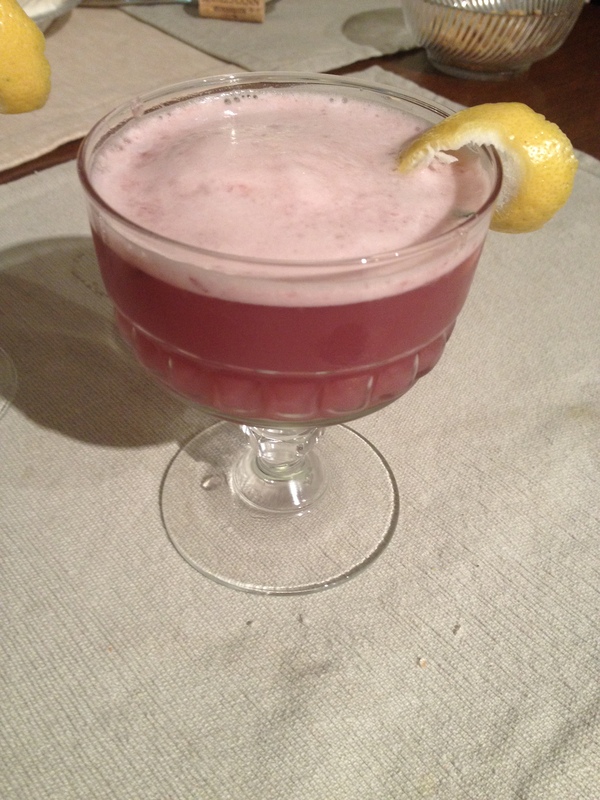 The Concord Grape Gin Fizz is a gin-based cocktail which I am normally not a huge fan of, but the combination of muddled grapes, port, sugar, and egg white made this a drink to remember. At first I was afraid the drink and the pie would be too sweet, but it was delicious and I could not believe how well they went together. The ‘theme’ of October’s issue was Wine so obviously I have to mention our pics for the evening. There was a major emphasis on versatile white wines, and both the appetizer and the main were paired with Rieslings. Sadly the selection of Rieslings is not the best at the NSLC, which is a shame because I really love this variety. Most people think that all Rieslings are very sweet, but it’s just not true! Some Rieslings are clean and fresh, like the one that we paired with the pork, Dr. Loosen from the Mosel Valley in Germany. It was a sweeter wine for sure, but still light and fresh and the sweetness paired well with the pork and the root vegetables and balanced the meal. 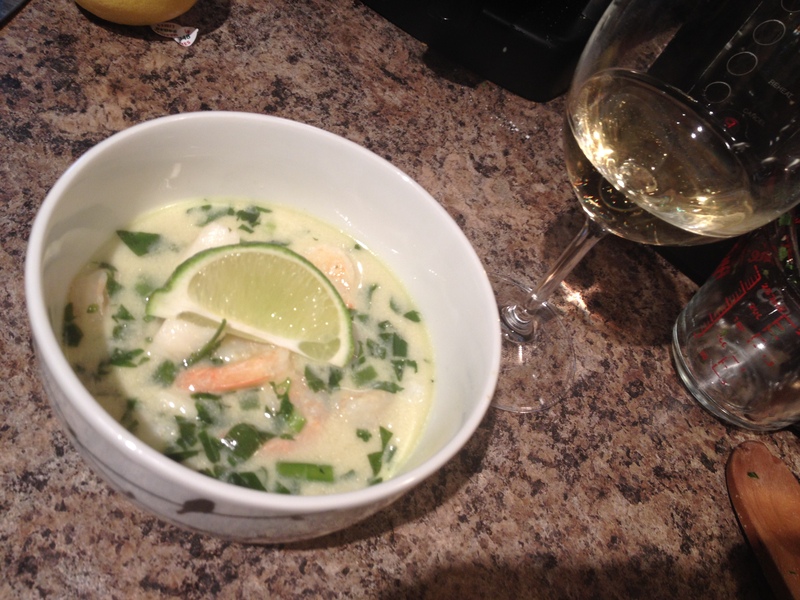 The wine that we served with the Thai Coconut Soup was definitely more of a classic Riesling, it was very yellow in colour, but was on the dry side. The Anselmann Riesling from Pfalz, Germany, matched the spiciness of the curry and jalapeno and helped balance the acidity. 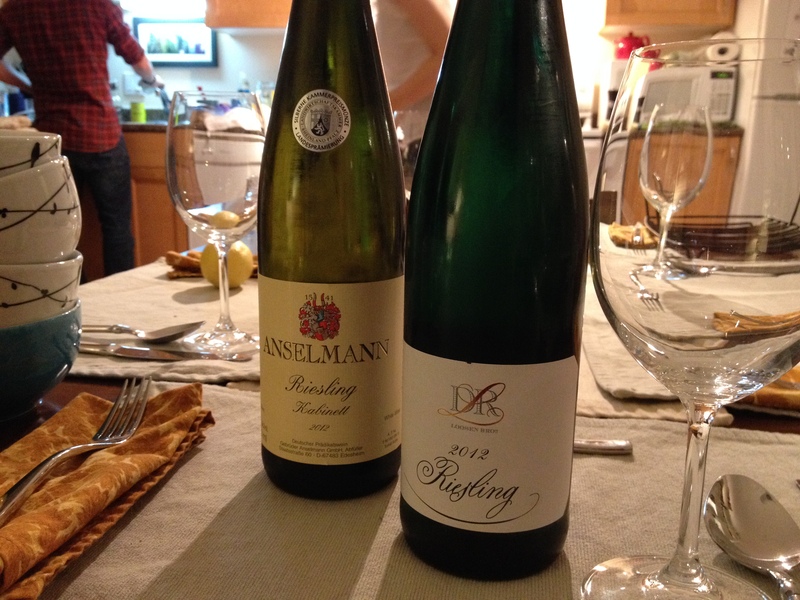 Both Rieslings were different and delicious! Overall the meal was a great success. All the recipes that were chosen ended up being fairly easy to make and had great results, and despite the lack of the selection at the NSLC, both wines paired perfectly with the dishes. And with another Food & Wine Cover Recipe Challenge in the books, I can say without a doubt that I have found the best PB & J recipe that is out there: grown up PB & J with whipped cream and booze, how can you not Explore. Eat. Repeat. this delicious combination at your next dinner party. Bon Appetit!